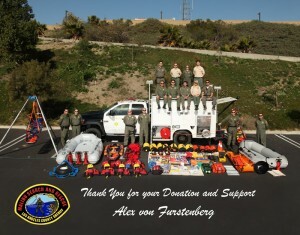 The Malibu Search & Rescue (MSAR) Team has announced a personal gift from Alexander von Furstenberg which has financed the purchase of rescue equipment critical to their efforts. MSAR is a non-profit, all volunteer organization comprised of Reserve Deputy Sheriffs and civilian volunteers who participate in the search and rescue of lost or injured persons within a 187 square mile section of the Santa Monica Mountains. The Team is affiliated with the Los Angeles County Sheriff’s Department and is a member of the Mountain Rescue Association. Alex, an avid kite-surfer and active outdoorsman, resides in Malibu with his family. In addition to his support of MSAR, Alex recently demonstrated his passion and concern for the well-being of his Southern-California community and its environment by pledging $150,000 over 3 years to sponsor Malibu’s comprehensive beach water quality program, the Beach Report Card. Backed by Alex’s family’s foundation, The Diller – von Furstenberg Family Foundation, and Co-sponsored by the non-profit organization Heal The Bay, the Beach Report Card is California’s only program dedicated to the extensive analysis of water quality along its coastline.